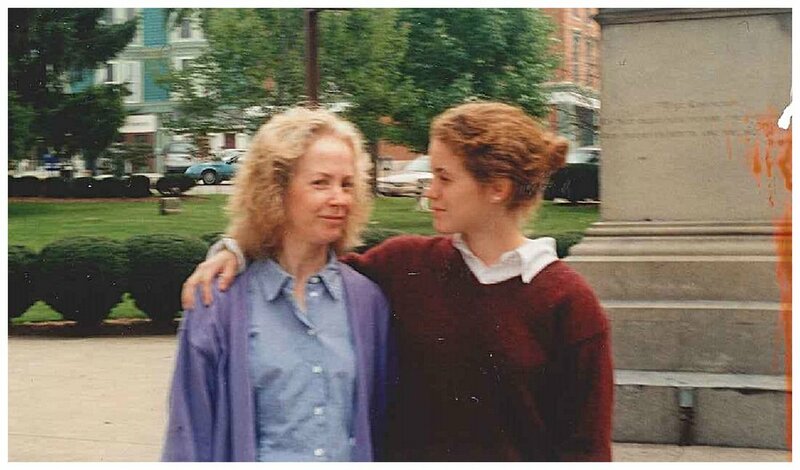 My mom was my best friend. As our milestone birthdays approach, the loss is more angular. I have more moments where I feel bereft. On good days, it fuels a fast run, in preparation for this (intimidating) marathon project. I was so sad today, this morning. I was thinking about the trip we took together, between our birthdays, your 50th and my 20th. We flew into Miami, rented a convertible and drove down highway 1 to Key West. We spent a long weekend in an awesome b&b. Our room had two separate beds. You let me sleep in the one up the spiral staircase to the turret. (How did you find that place?) We got our palms read.I scuba-dived; you bailed at the last minute. We had key lime pie at least two meals a day, every day, taste-testing. You bought beer (Pete's Wicked Ale!) at the grocery store and we sat on our porch, overlooking whatever quaint street we were on, and we burned candles that we bought at some market, and I can still see our feet up on that railing. I can see that your toes were painted and mine weren't. But there we were, sitting beside each other, talking until too late. We joked about what we would do for 30/60 and, of course, 40/70. I guess we would have started planning it around now. This year, today, I am missing you. I am wishing that I could sit in my yard with you, have a beer and talk until too late. I have missed so many years and stages of your counsel and advice. The idea of my being 40 was, 19 years ago, actually laughable, but I'm almost there now. And it's just guess work as to what you would say or do or think. You were someone so ripe for growth and new experiences that, at 69, I can confidently say that you would not have been identical to the woman I knew who was killed at 56. But, I can tell you this, Mom: I learned something new today. I people-watched today. I dug through a bin of not-quite-his-size-yet shirts to find the right Batman shirt for my sweet 2 year old today. I found extra compassion and empathy when one of the boys had a really tough moment today. I tickled my kids and gave them hugs. I did sit and have a beer in my yard. I listened. I talked. I watched junk tv. I exercised. I breathed. I felt love around me. I hope that I, too, am someone ripe for new experiences, for growth. I bet I'm not the person that you lost when I was just 26. What proportion of who I am comes from you, or the loss of you, is just guess work, too. But, we're connected, you and me. Today and always. Happy Birthday. I love you and I miss you.